tobias feltus: créateur » Blog Archive » Piazza Camera, kamra-e-faoree, or that which is kind of Polaroid and kind of darkroom. Piazza Camera, kamra-e-faoree, or that which is kind of Polaroid and kind of darkroom. A few years ago, my father bought me this curious camera at the street market in Pissignano (TR). He remembered having been photographed on a similar machine when he was a teen, maybe in Naples or Rome, but we were not clear on how they worked. Deduction showed a lightproof storage chamber, a long sleeve, a very crude shutter mechanism, what I thought to be a printing-out window at the top, and two vertical chemical trays in the bottom. What he remembered was that they were used by photographers to take street portraits of people, and hand them a print just minutes later. And hence its vague connection to Polaroid. But the similarity ends there. My reason for writing this, is that I just stumbled upon this website, which has a wonderfully comprehensive study on the use of these cameras in Afghanistan. The site explains how they work, and also has an extensive collection of photographs taken with them, and of them in use today. It even has an eBook to download, which explains how to build one. It is hardly worth noting, but the authors of the website do specify that the Afghani street cameras have an internal focus mechanism (moving the paper negative to and from the lens), as opposed to having a bellows, like my camera, to focus in a more typical manner. The use of the kamra-e-faoree is hardly practical – by our modern expectations – but nonetheless wonderful. In principle, a photograph is exposed onto silver-gelatine paper. The paper negative is then developed and fixed within the darkroom of the camera body, and placed on a stand at the front of the camera where it is re-photographed, to produce a positive (again on paper), which is developed, fixed and then rinsed in a bucket or fountain. 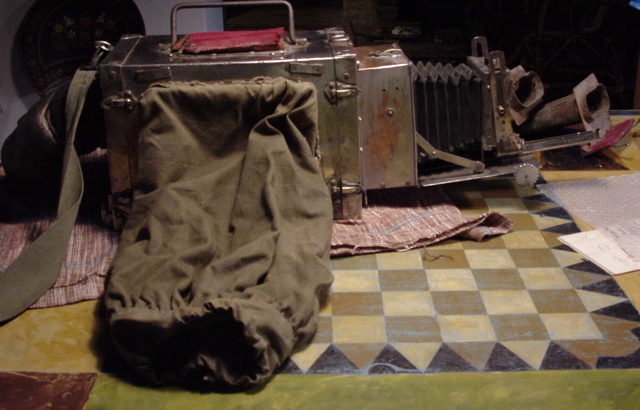 Though the Afghani cameras were predominantly used for ID photographs, the process they use is identical to that of the European tourist cameras: a system that I imagine has been in use worldwide, but seems to have slipped past most of our knowledge, and is not mentioned in any book that I have ever read on photography. Somehow this process seems both more romantic and more practical than those predatory snappers who plague tourist traps with cameras, and hand you a card offering you prints the next day from their studio (though I don’t know if this still happens, as I have not been a tourist since the advent of digital photography).